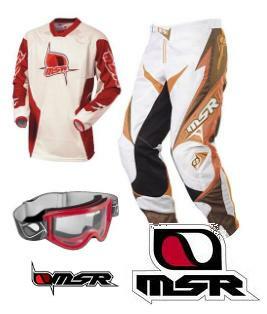 msr gear or Malcolm Smith Racing gear to be exact is Just The Best. 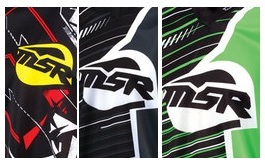 MSR gear - so good. Comparing MSR Gear to the Competition. Experience often leads to the creation of useful add-ons to an activity, and the story of MSR gear is no exception. In 1971, Malcolm Smith used his racing experience to enhance the safety of dirt bike riders with MX protective gear. Short for Malcolm Smith Racing, MSR continued to add gear such as boots, jerseys, protective armor and casual apparel reflecting motocross scenes, brands and stars. Although he sold the business, Smith continues to participate in the area of product development. Does MSR gear get more hype than it is worth or can additional glory be added to the brand? This is one case where overrating will never occur because the quality is exceptional and the price affordable. As technology advances, so does the product line without sacrificing value. Very comparable in pricing with other quality brands and even less than others, such as FOX, consumers will find a well-designed item in the durable, yet appealing MSR 2013 Rockstar pants, which feature burn-resistant embossed leather inner knees, a mesh liner and adjustable waist straps for $135. The top-quality matching jersey is available for $42. Brian Deegan and the demo team from Metal Mulisha are wearing a 2012 DOT and Snell approved, MSR Velocity Helmet - Metal Mulisha. 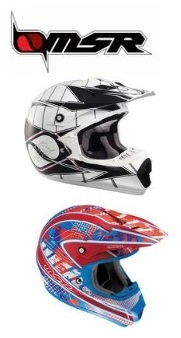 An excellent bargain at $170, it features a poly carbonate shell & the light-weight helmet carries a number of graphics and features for excellent appearance and protection. The ergonomically designed Elite boots stand out as an MSR flagship item. The rider's safety takes top priority as each key point features plastics for protection. Because the shell is leather, it takes less time to break in the boots, while padded interior walls and an inner sole offer comfort during the break-in process. The two-piece cam lock buckles are easy to use and quick to fasten. Weighing less than a half-pound, the Vektor belt beats the opposition by providing extra support with its dual v-straps. Coarse mesh vented mainframe fabric with internal plastic stiffener ribs adds protection to this MSR gear by surrounding the low profile rubber support panel in the center area. I patronize MSR gear as a tribute to the actual man behind Malcolm Smith Racing or simply msr racing. M.S.R. Gear - affordable motocross equipment. Malcolm Smith Racing makes MSR gear and motorcycle products but the acronym MSR is easier for most people to remember. Smith, an off-road racing Hall of Famer, knows what he's talking about when it comes to racing gear. Even though he's older than many of the grandfathers of the racers, he can still leave most of them in the dust when he hops on one of his bikes. He won many major races on bikes and did well with four-wheel racing. He runs an annual charity event for an orphanage in Baja, the place where he won the Baja 1000 three times in a car and three times on a motorcycle and the Baja 500 four times. The event is a six-day ride and the profits from the ride are in the hundreds of thousands of dollars, all donated to an orphanage for children from the area. It makes sense that the man who won off-road races on any type of bike and car should know a lot about the protective gear. That probably is the biggest reason that MSR gear is so rider friendly. The construction and design has to pass the most critical test, because it bears the name of one of the off-road champs that still rides after more than a half century of successes. Even though Smith sold MSR, the company still produces flashy designs and excellent quality. The MSR Racing Max Air pants are a mesh construction which offers great ventilation for those rides in hotter weather. The same is true for the jerseys. Even the gloves give you the feel of the bike on your palm and a comfortably cool ride without exposing you to pain after a long day of racing. When you speak of MSR gear, most riders automatically think of the MSR Racing Velocity X helmet. This helmet with a high-gloss finish stands up to a lot of abuse but allows you to remain cool thanks to a removable liner and closeable airports. 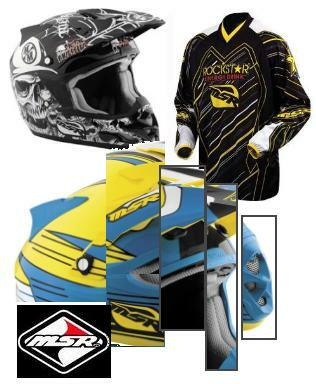 MSR gear is affordable and a great bargain for every type of racer. It’s a beginner’s dream to become a legendary dirt bike racer who has weathered the odds and came out of the game strong and successful. Of course the main reason is because most of the clothing and motorcycle products look so cool, especially the MSR helmets. Speaking of helmets, I chanced upon those pink neon helmets while browsing online for pocket bikes with dandy MSR wheels. Who knew that I could be introduced to a legendary line of racing equipment simply by looking for parts & alloy wheels. Unlike some apparel that relates to the sport, the brand of msr gear is based on the efforts of a real legend in the dirt biking scene. The namesake of Malcolm Smith Racing is an old man now, which proves the theory that if a rider is skilled enough, he can retire to old age and still keep his love for motor racing going. In Mr. Smith’s case, he created branded gloves and helmets that truly look like classics, especially the pink helmets. Although there are some cool colors like green and blue, I still think manly riders can wear pink, especially if it’s a part of a racers equipment -(ok don’t quote me on that). Actual racers or biking enthusiasts, as well as their entourage of fans, have their pick of msr racing equipment and most of the newest gear available. But it gets confusing as to which to buy at a good apparel store, with so many top brands floating around. There are conundrums like would you pick msr motorcycle gear over fox racing boots ? or maybe your considering thor riding gear ? Well you can mix and match a little, where it's appropriate. I imagine those answers are left to individual choice, and of course what’s in stock and what fits comfortably!